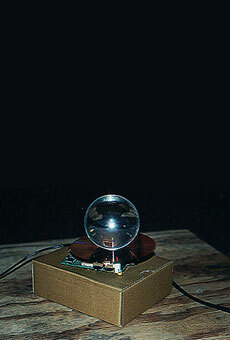 »Stygian Eye« comprises a clear plastic ball, a compact disc and an LCD screen taken from a handheld TV. 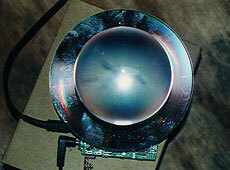 As the viewer approaches the object and peers into the ball, video showing an animation of a scientific study of a flying horse glows from the below screen. By Andrew Cooke and C505.